Thirty down. Twenty five to go. I took this picture of the Uptown marquee one evening in early June. 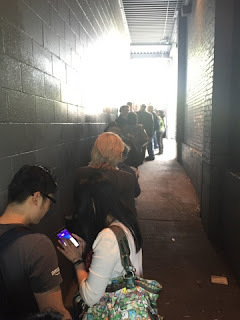 As I stood outside the theater a young couple burst through the doors to ask what I was doing. They were very excited and I soon learned why: the film they had produced and directed was about to have its first screening. For me, their enthusiasm captured the essence of SIFF. We tend to associate film festivals with glamorous movie stars on red carpets. SIFF, however, is all about the joy of making and seeing movies, with a huge and highly diverse audience and a prodigious number of films from around the world. The two young filmmakers epitomized that joy. Our family looks forward to the festival each year, and many texts are exchanged about who will be seeing what and with whom. This year my favorite was the quirky, endearing and well-witten Canadian film Henri Henri. It is about the life and loves of a boy whose only skill is changing light bulbs. He puts that skill to good use while building a life outside the convent where he was raised. Founded in 1976, SIFF is a year-round film organization bringing independent film to the Seattle area from all over the world. SIFF produces the annual Seattle Film Festival, SIFF Cinema, and SIFF Education. 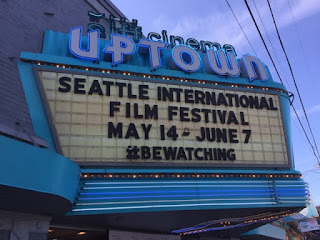 In addition, SIFF operates the Uptown and Egyptian theaters and the SIFF Film Center on the grounds of Seattle Center. The 25-day-long Seattle Film Festival is the largest and best attended film festival in the United States. Each year it attracts over 155,000 attendees and more than 450 extraordinary features, short films and documentaries from both major and independent American studios, as well as international works from Europe, Asia, Africa, Latin American - over 80 countries in all. and enjoyed at the festival. Twenty nine down. Twenty six to go. Town Hall prides itself on incredibly diverse offerings. For this project we have already been to Town Hall twice, first in December to hear the Early Music Guild play Christmas music, and then in February to see Sherman Alexie at the Seattle Arts and Lecture's Poetry Series. 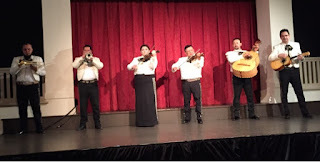 For our "official" visit dedicated to Town Hall we caught a Saturday Family Concert with our grandkids to hear the Seattle-based group Mariachi Fiesta Mexicana. Held in Town Hall's basement, the Saturday Family Concerts are great opportunities for families to experience art and culture in an informal atmosphere. Kids are invited to sit on the floor in front of the adults, who mostly choose the chairs (at least the grandparents do!). Kids are encouraged to engage, and there are only a few rules (dancing ok; running and screaming not). At the Mariachi show the children were excited but also well behaved. The band invited the audience to sing along with a few classic favorites, but also shared the breadth and beauty of the genre with numbers featuring a variety of instrumental and vocal performance. It all made for a very relaxed and fun family atmosphere that seemed to bring out the best in the artists. They clearly enjoy the enthusiastic young audience. 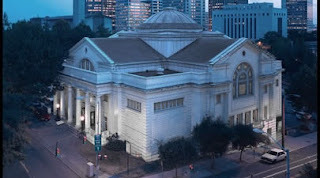 Since its founding in 1999 Town Hall has hosted "an impossibly wide array of programs - music and politics and science and literature and community action and on and on...." The programs are so numerous and varied that the Town Hall Website even features a random event generator - one click suggests a Town Hall event. This strikes me as a great way to expand one's cultural and intellectual horizons. With an audience of over 100,000, Town Hall works to keep its programs accessible to all through inexpensive rental rates and ticket prices. The Fiesta Mexicana, at a very affordable $5, was a great example. Twenty eight down. Twenty seven to go. well mirrored the night outside. Even if you are not a "jazzoid", it doesn't take long at a Count Basie concert to find yourself listening to very familiar music. The world clearly loved Count Basie, and the Seattle Repertory Jazz Orchestra gave a loving tribute to his music in celebration of the orchestra's twentieth anniversary. SRJO is a professional ensemble composed of nineteen top jazz performers from our region. 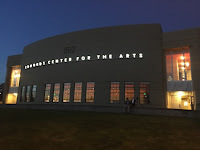 We saw the orchestra on a recent Saturday evening at the beautiful 700-seat Edmonds Center for the Arts. SRJO, which has established schedules in Seattle's Benaroya Hall and the Kirkland Performance Hall, is now adding Edmonds to the orchestra's concert season. The large and enthusiastic audience at the Basie Bash demonstrated the good sense in this move. 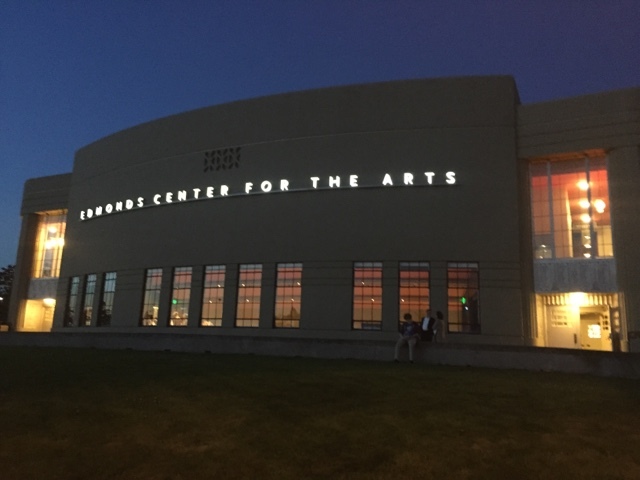 We were joined at the concert by some old friends, one of whom serves on the Orchestra's board, and Edmonds proved a wonderful place for dinner and an engaging show. SRJO has a serious commitment to young musicians. Jazz Scholars is the orchestra's school-partnered pilot program that provides music education for low-income and minority band students. Jazz4KIDS Concerts provide children and youth the opportunity to hear live jazz in a concert hall. The Basie Bash demonstrated SRJO's focus on youth through the appearance of three guest soloists from the Edmonds-Woodway High School Jazz program. The Orchestra clearly enjoyed sharing the stage with three aspiring and inspiring young musicians. In addition to professional performance, many in the orchestra are educators, in particular SRJO's co-artistic directors: Drummer Clarence Acox directs the award-winning Garfield High School Jazz Ensemble and saxophonist Michael Brockton has been on the UW music faculty since 1987. Want to enjoy some jazz? 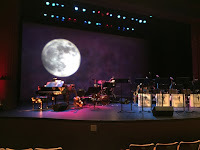 I highly recommend the next season of Seattle Repertory Jazz Orchestra!